At this one year anniversary of Michael Jackson's passing, I'd like to share this beautiful story which emerged last Summer in Taiwan, soon after Michael's sudden death that shocked the world. It touched many people in the Far East, but for the rest of the world, it's still remains widely unknown. Apart from this story, I'm hoping to translate and share as much as I know about Michael, as well as my thoughts. Below article was first shared on MichaelJackson.com on 26/06/2010 (http://www.michaeljackson.com/us/node/871501) before I created this blog and posted more updates on the story, see part 2-5 links at the end of the article. 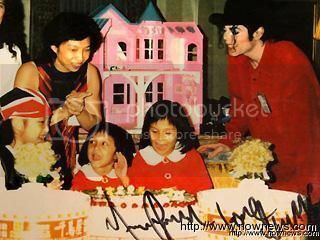 A Taiwanese fan Mrs. Ma Qi Zhen not only met Michael along with her family, but also become a close friend of Michael for many years. Mrs. Ma has always kept a low profile of their 17 year family friendship, until Michael's sudden passing last June. She has spoken out for the first time in the media last Summer, paying her tribute to how incredible kind, loving and approachable the King of Pop was. She has shared her memories of an extraordinary friend, deeply saddened by his passing and frustrated by how mis-understood Michael was. The friendship began through a simple fax. Like thousand of others, Mrs. Ma simply wanted to see Michael perform in a concert. It was Michael's first time in Taiwan on the Dangerous Tour, in September 1993, the first ever mega star to visit Taiwan at the time. However, Mrs. Ma and her husband had trouble getting tickets for their nine month old twin daughters, as ticket were denied for safety reasons. Mrs. Ma wouldn't settle for this so decided to fax to the hotel that Michael was staying in Taipei. Addressed to Michael Jackson and asking him directly to allow her twins to go to the concert, she didn't expect Michael to even see it. To their surprise, Michael had read the fax and responded! As soon as he saw twins's photo on the fax, he immediately send down his secretary with VIP passes for the family to be able to come to the concert and meet him personally backstage before the concert began. Never in a million years had they thought a fax would lead to the meeting of Michael Jackson. However, thing didn't go according to plan, when it was time to meet Michael, they were stuck in traffic, full of thousand of fans going to the concert. By the time they arrived, the concert had started. Fortunately the Ma family was able to meet Michael at his hotels presidential suite after the concert. Although he was already changed into his pyjamas ready for bed. Unlike his super star image, he was very kind and approachable, Ma recalled that he was so fascinated by the twins and wanted to know everything about bringing up babies. The twins were crawling around in his room, at one point one of the twins grabbed his CD player and started to bite it. Michael immediately went to pick her up and softly said, 'don't bite, it'll hurt.' Ma recalled that although at the time he was not yet a parent himself, he was very protective of children. This also happened to be the darkest and lonely time of his life, as he was just being accused of child abuse for the first time by Evan Chandler, which made headline worldwide, but it didn't stop him continue to care for children. When they said goodbye, Michael personally walked them to the lift (elevator) and promised to invite them to come and visit him when he returned too America. Ma family never took his words seriously, but Michael meant it! During their 17 year friendship the family were invited 6 times to be guests at his Neverland home, they even travelled to places in other parts of world with him. 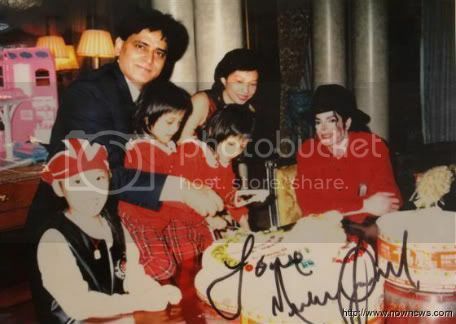 even attending his wedding to Debbie Rowe in Australia. Every time they said goodbye, he would cuddle them and whispering "always love", and "promise that you will love me always". He simply wanted to be loved. 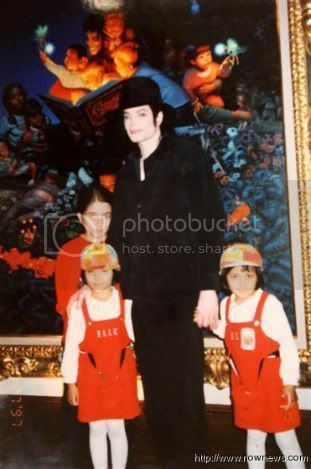 Michael adored the twins Prety and Morly, when he returned to Taiwan for the History tour in 1996, he invited them onstage for the 'Heal the world' song. He even invited the family to follow the History Tour with him. The twins also featured in 'Heal the World' along with Michael in Durban, South Africa, which was said to be his last ever concert. Michael had confided things about himself, like his iconic sequin glove, was first used to hide his skin problem vitiligo that first appeared on his hand. The glove become more iconic than his hat, in truth the hat was his favourite! He even referred to himself as Chinese. As according to Michael his mother Katherine is a quarter Chinese descent. Ma never asked Katherine about it, but Michael often expressed his strong desire to perform in China. According to the Taiwanese concert organiser Mr.Yu, during both his Dangerous and History tours in Taiwan in the 90's, Michael asked him to help him to perform in China. Yu did his best but at the time China was a very different country, not yet ready to open up to Western pop culture. It did not happen in time for Michael. Ma had often seen a very sincere and caring side to Michael. During the History Tour in Taiwan, when in a car being pursued by fans on their scooters, Michael was so concerned about their safety he asked the driver to slow down, and asked her to speak to fans in Chinese. As soon as she wound down the window the fans went crazy when they saw Michael! Another fun memory was when Michael took them and other children to visit a haunted house in Universal Studios one Halloween. As soon as all the 'ghosts' realised it was Michael Jackson, they were shocked and stopped pretending to be ghosts. 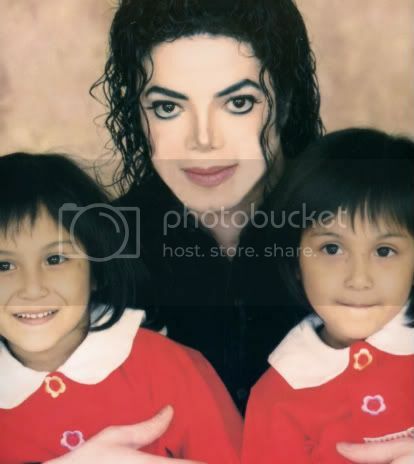 This frightened the children and some started to cry, Michael stood between them, blocking all the 'ghosts' away from the children, "Stand back!" he told the 'ghosts'! Ma remembers Michael, as pure and innocent, like a big kid, he loved surprises, magic tricks, he was very compassionate, very trusting and very caring. With Ma's observation of being a mother over the years seeing Michael's interaction with children that he sincerely loved and cared for children with all his heart, and not what some elements of the press have portrayed. Sadly Michael's gone, by sharing her story it lets the world know the true nature of Michael Jackson, and at the same time they just feel so fortunate for all the precious memories that Michael has left them. The world had sadly lost a greatest music icon and a beautiful soul. The video below was sent by Michael to the Ma family after the History tour. 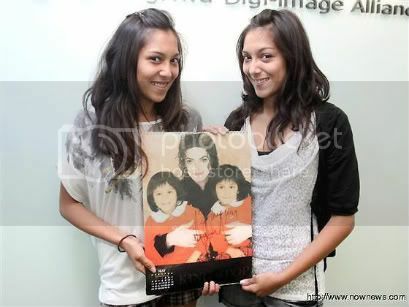 It features the twins with Michael sining 'Heal the World' in Ma's home city Kaohsiung, Southern Taiwan. Towards the end of the song, Michael made a special effort to say, "I love you" in Mandarin to the audience. This he had asked the twins to teach him before the performance. His interactions with the twins was just so sweet. Rest in peace, Michael, we'll miss you. every year, so he could see how they were growing up. through the songs that he sings.